When you think about hospitals, you often think of sickness, emergency rooms, doctors and other things, but rarely do you think about laundry. The reality is that hospitals go through as much, if not more laundry than your average corner Laundromat. The Wyoming Medical Center reported that their laundry facility cleaned roughly 3,000-5,000 pounds of laundry each day, in 2014. This huge amount of laundry includes bed linens, hospital gowns, medical scrubs and more. The importance of clean laundry in a hospital setting cannot be understated. Without clean linens, a hospital could not serve patients. If laundry were not properly cleaned, patients could end up using linens that were dirty, which could be a huge problem in terms of the spread of germs, but also in terms of negative PR for a hospital. Equipment used in hospital laundry facilities is much different than what you would see in consumers’ homes. Hospitals require large washers and dryers that can handle hundreds of pounds of laundry at a time. While this equipment is extremely powerful, it is also very expensive. 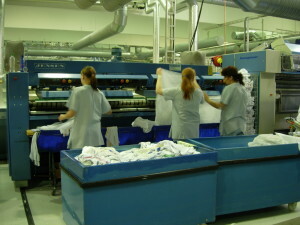 If a machine breaks down during a busy hospital shift, it means that hospital personnel have to work overtime to keep up with the constant flow of laundry in a hospital. One of the causes of equipment malfunction in a hospital laundry facility can be overloading. This refers to loading too much laundry into a washer or dryer resulting in damage to the machine. Damage to commercial laundry machines can result in thousands of dollars of out-of-pocket expenses as well as hours of downtime that a hospital simply can’t afford. While machines may malfunction when they become overloaded, it’s still vital that a hospital put as large a load as possible in to ensure supplies are not wasted. Therefore, hospitals must be sure each machine is loaded up to its capacity and nothing more. In hospitals, laundry is often loaded into a cart or trolley and placed on a platform scale. The scale weighs the entire load of laundry, subtracting the tare weight of the cart to then issue a weight reading. This reading helps hospital personnel ensure that they’re not overloading laundry machines. In the past, mechanical beam scales were often used in commercial laundry facilities. The problem with these scales was that they were difficult to read and often required expensive repairs. These scales were built from a number of moving parts, which over time caused inaccurate readings due to normal wear and tear. Digital scales have been around for quite some time, but many businesses have not been able to take advantage of their many benefits because of the high prices. At Arlyn Scales, we’ve changed this paradigm by manufacturing our Arlyn Series 3200 platform scales, which have no moving parts and are completely digital and priced competitively, compared to mechanical scales. We’re able to keep our costs down because we build our scales in-house from our Long Island warehouse and ship them directly to you – cutting out any markup from intermediaries. Our scales also do not require regular servicing from a dealer due to their lack of moving parts. In hospital laundry facilities it’s important for scales to be extremely durable with their exposure to a variety of chemicals as well as moisture. Many scale platforms are built with aluminum, and while we do offer aluminum as an option, this metal is not optimal for facilities that require heavy usage. For these types of applications, we offer a stainless steel platform that will stand up to the daily rigors of a hospital laundry facility. We also offer a galvanized epoxy coating that helps to further protect the platform from corrosive materials such as harsh chemicals and detergents used to clean soiled hospital laundry. Aside from the heavy-duty material of our platforms, we also offer ramps that allow you to easily wheel the largest of laundry carts onto our platform scales for accurate weighing. Our scale platforms are also built at just two inches high, which makes loading and unloading of laundry carts extremely easy. Our standard platform dimensions are 20 x 27, 48 x 48 or 27 x 60 inches. However, if these sizes do not fit your needs, we can design and build a custom scale to fit any sized cart you are using in your laundry facility. Load cells are among the most important components of a scale. While other manufacturers use inferior materials for their load cells, Arlyn’s platform scales are constructed with stainless steel load cells that are embedded in a robust metal frame and then placed in the four corners of the scale platform for superior accuracy. This high level of construction holds up to the constant abuse seen in most busy hospital laundry facilities. Our platform scales are equipped with a 32-bit high resolution RISC digital indicator that can be configured to display a variety of information including weight, item descriptions, tare information and a variety of other metrics. The display indicator can also be mounted on a wall or bench top if necessary. If you’re interested in learning more about Arlyn Scales as well as our 3200 series platform scales for your hospital laundry facility needs, don’t hesitate to reach out to our team of experts today at 800-645-4301. If we don’t have a scale that meets your needs we’ll be glad to discuss our variety of customized scale solutions.